Sure you can drink a mojito but why not use all the favorite flavors in this shrimp recipe? Mojito Shrimp. Cheers, er, Yum! I can’t name a single Sammy Hagar song. Doubtful I’d recognize one of his songs if I heard it. But I’m pretty sure I’d like to sit at his table. Especially given the dedication from his book, Are We Having Fun Yet? His Sicilian grandfather, Sam, was his inspiration for his palate, enthusiasm for food and sharing it. Flamboyant, irreverent, the life of the party and full of life, in an interview on the Splendid Table, I learned Sammy is also a storyteller. And an entrepreneur. Did you know he founded Cabo Wabo Tequila? Cabo San Lucas is one of his muses for songs and life. He owns a home and cantina there. He also has a home and rum company in Hawaii (Sammy’s Beach Bar Rum). Just like in the rehearsal studio, Hagar encourages riffs. The last pages of his book are for riffing and tweaking recipes. I laughed out loud when I learned this month’s challenge from TheRecipeRedux was to “Grab a Book & Cook.” Simp City for me since I always have a cookbook nearby. Lucky for me (and you) that the book I was reading was Sammy Hagar’s! Because The Recipe ReDux has been around for 54 months, those creative cooks asked us to grab our nearest cookbook and ReDux the recipe on either page 54 or 154. In Are We Having Fun Yet? page 54 was Sammy’s Wabo Shrimp, 154 was Sammy’s Risotto. I learned in the Splendid Table interview that mojitos are one of Sammy’s favorite drinks, so I created mojito shrimp using island friendly ingredients – pineapple, mango, rum. Here’s is my riff on the tequila-based Sammy’s Wabo Shrimp. 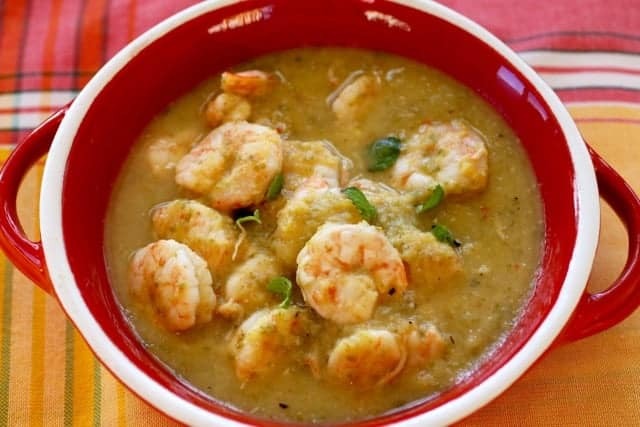 Sure, you can drink all those yummy ingredients, but try them on shrimp. Yum! 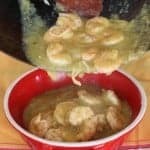 This recipe uses ingredients that are easy to find, plus it’s quick to assemble and cook which is just what you want when you want to invite some folks to dinner – Sammy Hagar style. I’ve heard from readers that they get confused when they try to buy fish. To make sure I have fish on hand, I’ve been ordering fish for home delivery via Vital Choice, an online retailer selling wild-caught, sustainably harvested Alaskan salmon and northwest Pacific seafood such as halibut, tuna, shrimp and lobster. 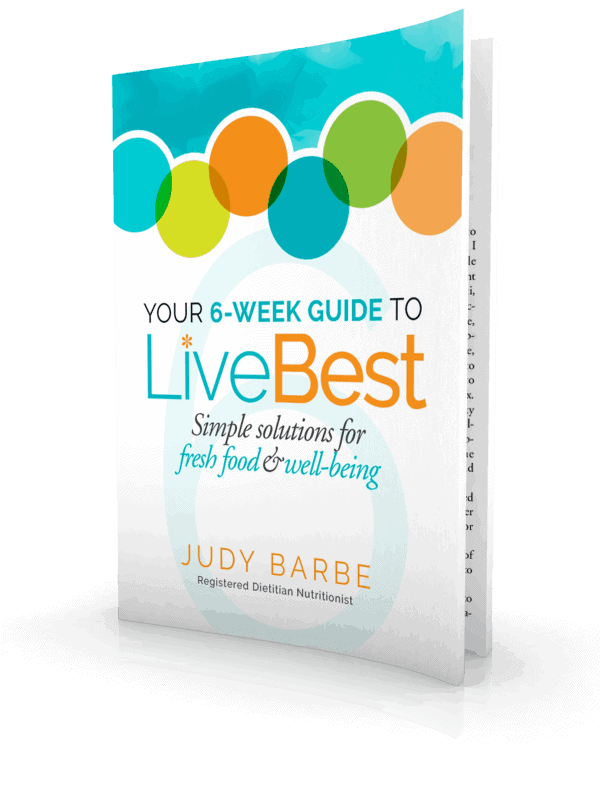 I love convenience, so knowing that I can get delicious, healthy, eco-friendly seafood delivered to my door makes life so much easier to have these things on-hand in my freezer. Vital Choice has a loyalty program where you get points for every dollar you spend, redeemable for discount coupons. I met the owner at a nutrition conference where we were able to talk about his business. Before founding Vital Choice, Washington State native Randy Hartnell spent more than 20 years fishing Alaskan waters for salmon, herring, and other regional species. His goal is to bring those fish and their health benefits to a larger market, while fishing responsibly to preserve the sustainability of wild fish and seafood. All of the Vital Choice seafood is certified sustainable either by the Marine Stewardship Council (MSC), the State of Alaska’s Responsible Fisheries Management (RFM) program, or Monterey Bay Aquarium’s Seafood Watch program. Sure you can drink a mojito but why not use all the favorite flavors in this simply lovely dish? Mojito Shrimp. Yum! Combine mango, pineapple, lime juice and zest, jalapeños, garlic, salt, pepper and rum in a food processor or blender. Blend until smooth. 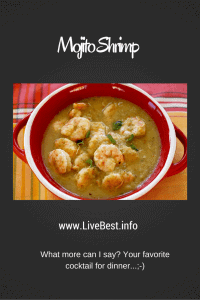 In a shallow glass or stainless steel pan combine shrimp with marinade. Marinate in refrigerator for at least 30 minutes. Over medium-high heat, heat the oil in a wok or skillet. Drain the shrimp, reserving the marinade. Add shrimp to hot pan and cook them just until they change color and start to turn pink, about 3 minutes. Remove the shrimp and set aside. Pour the marinade into the pan and cook until the liquid reduces by half. 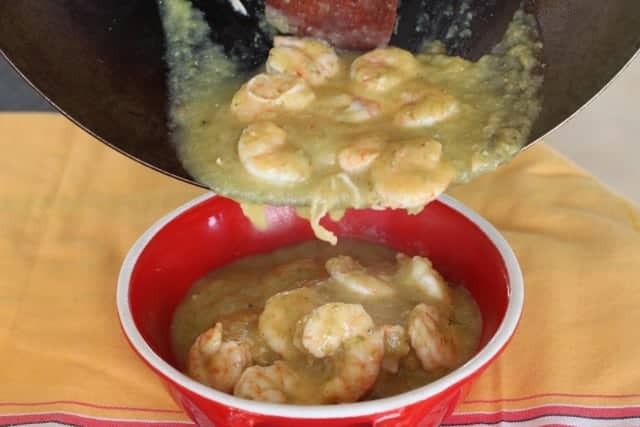 Return the shrimp to the pan and simmer until they are cooked through, about 3 minutes. Though Sammy claims to love eating fresh fruit, his book is rich with cocktail recipes. 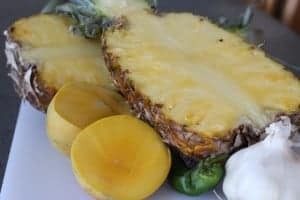 Of course, you could eat the leftover pineapple and mango, he just might use the fruit in cocktails. I have some tips on cutting a mango here. I heard that interview w. him Splendid Table too and was pleasantly surprised by it! I’ve been to Cabo Wabo in Cabo San Lucas and I only know his Van Halen songs (love “Right Now.”) And this recipe looks glorious – combining one of my favorite foods with one of my favorite drinks! I said Sammy who? when we were near his restaurant in Cabo. Now I wish I’d gone in. Next time! Mojitos are one of my favorite drinks so I love the sound of this! One question… did you use pineapple juice or a cup of actual pineapple? Hi Marisa, I used a cup of fresh pineapple and pureed it, but because it’s a marinade, there is a lot of room for flexibility.